The Silverstack and Silverstack Lab library versions advance over time across software releases. This is a natural process when a software application advances but inevitably leads to incompatible library version when opening projects with outdated versions of Silverstack/Silverstack Lab. We always recommend to use the latest version of Silverstack/Silverstack Lab which can be downloaded on the Pomfort Downloads page. Like this you avoid the situation this article takes care of. The term “Library Version” basically refers to the state of the Silverstack database and which information it can currently store. When updating Silverstack to a newer version the existing library is migrated to the latest version. That process establishes compatibility of the existing library with the new library version. After the migration your library is in a later/newer state and therefore not compatible anymore with older versions of Silverstack. If you are forced by any circumstance to move back to an outdated library version of Silverstack, you can restore a backup that has automatically been created during the migration process. When you open a project that has been created with a later version of Silverstack in an older version the alert from Fig. 1 shows. Restore Backup: Silverstack automatically offers the possibility to restore the last state for which a backup was created that is compatible with the opened version of Silverstack. Backups are automatically created during migration. Automatic backups can be enabled in the Silverstack preferences’ “Backups” tab as well as manually triggered. Open with New Project: To be able to access Silverstack even though the particular project can’t be opened, you can create a new project to start with. You can again change to other projects from within the application then. 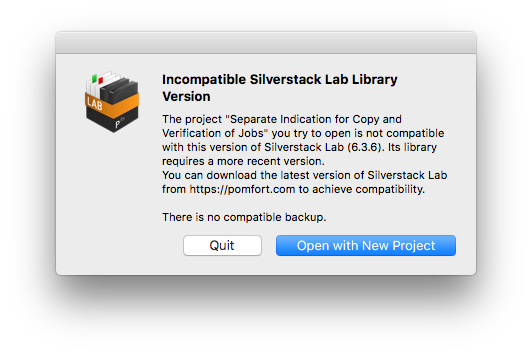 Quit: You can quit the application to open the project again with a later version of Silverstack that is compatible with the library version.